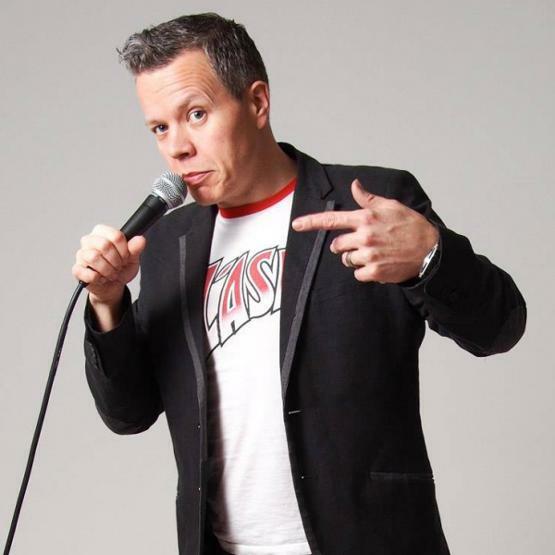 The Coastal Comedy Show with TV Headliner Paul Tonkinson! On TV, he’s performed on BBC One’s Michael McIntyre’s Comedy Roadshow and Comedy Central’s The Comedy Store and The World Stands-up. He’s also been a contestant on Channel 4`s hit show Celebrity Come Dine With Me and has completed a stint as a Programme Associate on BBC One’s Michael McIntyre Chat Show. Paul is supported on the night by up and coming Nathan Eagle finalist for Leicester Square’s New Comedian of the Year 2017 and Spinnaker Tower Comedy Gong Show winner! Opening the show is the incredibly funny Phil Jerrod who began his stand-up career underneath an Angus Steakhouse in 2012. Since then he has failed his PhD, walked out of his job in publishing and been entertaining audiences up and down the country with his elegant rants on the often unfathomable problems of modern life. 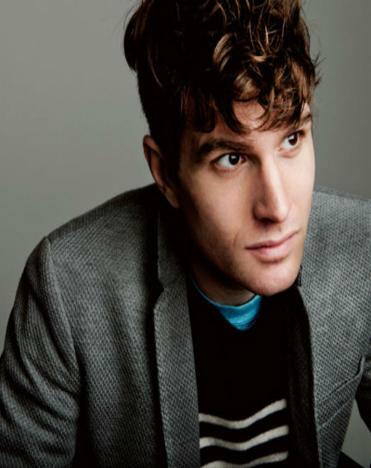 Come and enjoy a night of top live entertainment and get to see the sensational Jonny Awsum right here in Bournemouth at the best comedy club in town! Jonny Awsum exploded onto the professional comedy scene with a crowd-pleasing set that's seen him perform his special brand of musical comedy around the world. He's a comedic whirlwind, and has risen quickly from a fresh-faced newbie to a highly sought after headline act. Audience members don't just leave entertained, they leave as fans! Jonny has been traversing the UK, and indeed the World, armed with an impressive arsenal of jokes and his trusty guitar. He's a must see at comedy clubs, as his crowd-pleasing performance sees Jonny regularly ending his sets to standing ovations and demands of an encore. Equally at home in front of a camera, Jonny reached the semi-finalist stage for Britain’s Got Talent in 2017 and has also recently appeared on the nation's TV screens, presenting for Sky Sports, and is a familiar face from the current Experian adverts, and features in the Cravendale 'Cats with Thumbs' campaign, which has been viewed over a million times on YouTube. 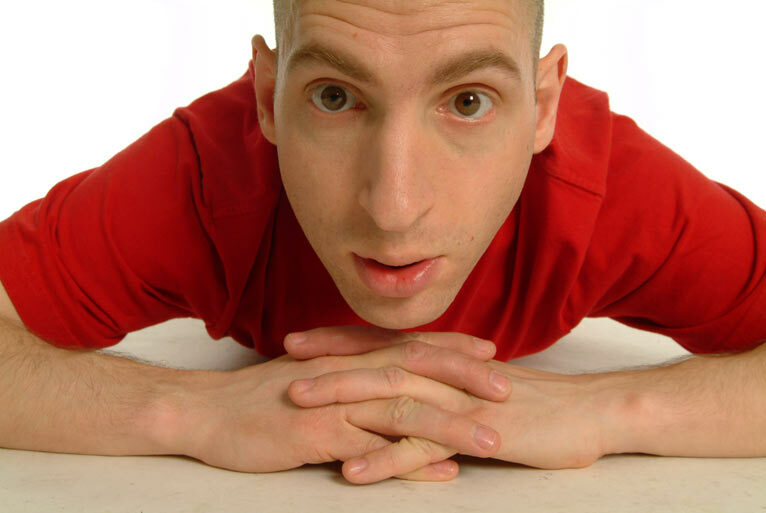 Plus support from Wayne the Weird, comedy magician and Fred Ferenczi who began stand-up in 2001 and has clocked up some 700 gigs in that time, performing all over the UK. Leicester Square Theatre Old Comedian of the Year 2017 – Finalist! The night is hosted by Adrienne Coles at Hotel Celebrity and we look forward to seeing you there! Our TV Headliner is the hilarious Rob Deering! 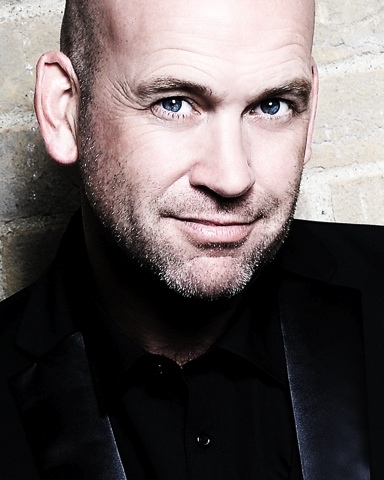 With his easy charm, cheesy singing voice, razor-sharp wit and clownish physicality Rob has quickly established himself as a firm favourite on the comedy circuit around Britain and you can see him right here in Bournemouth, Dorset. 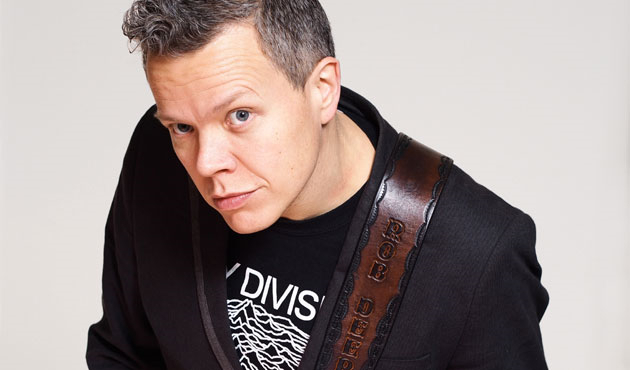 Along with being one of the most in-demand headliners on the UK circuit, he’s toured nationally and performed solo shows at the Edinburgh Fringe many times since starting out in comedy in the year 2000. He also recently ran all over Britain for BBC 6 Music. 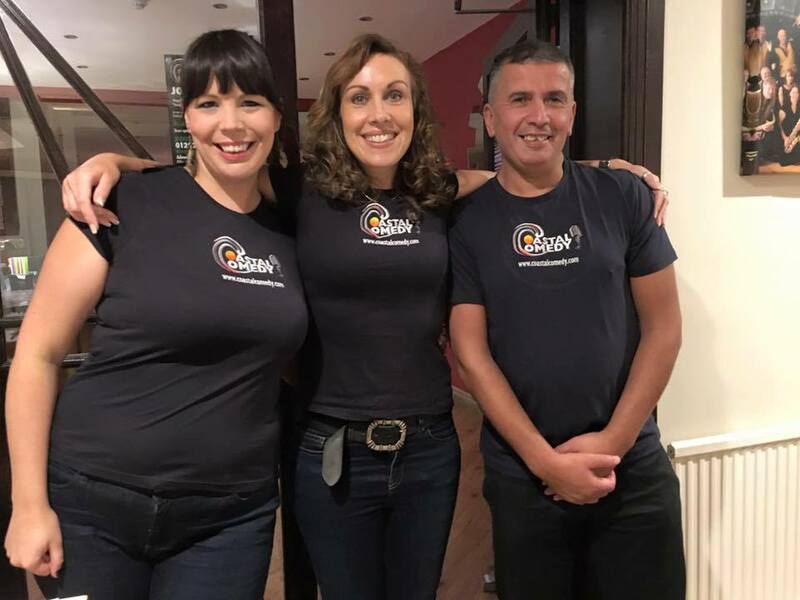 Yes, Rob runs and presents the podcast Running Commentary with fellow running comic Paul Tonkinson, and fundraises for his favoured charity Parkinson’s UK having run seven marathons. 'Bruisingly hilarious... brilliant musical comedian' (Time Out). Opening the show is charming Welsh comedian Phil Cooper who brings a unique blend of storytelling and smart jokes to any stage. This really is a fantastic line up and something for everyone as also performing on the night is Andy Field winner of the Chortle Student Comedy Award 2015, as well as finalist in the 2014 Leicester Square New Act of the Year, Andy has made an impact on the comedy scene with his unique style and fresh approach to traditional stand up. A regular at festivals such as Latitude and Bestival, Andy is fast becoming a familiar face at top comedy clubs around the country. He has hosted his own webseries in the Tub, in which he interviewed up-and-coming bands in the bath (of course). He has a Masters in Creative Writing from Brunel. The Coastal Comedy Show with TV Headliner Chris McCausland! 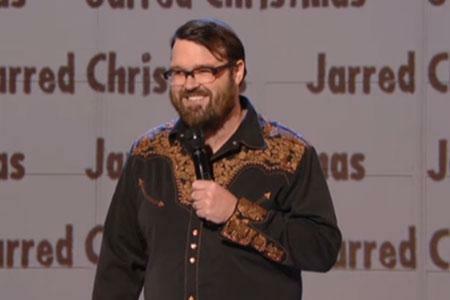 Chris McCausland is a British stand-up comedian and actor from Liverpool. Chris is blind, has been performing stand-up since 2003, and has long been firmly established at the very top of the UK’s live comedy circuit. He performs all over the country, including regularly at the world famous Comedy Store in the heart of London’s West End. Opening the show is the fabulous Sean McLoughlin who has supported the super-brilliant Doc Brown and Katherine Ryan on tour, and made an appearance on Russell Howard’s Stand-Up Central on Comedy Central. Also appearing on the night is Phil Lucas from Brighton who is a master of high-octane digital tomfoolery. Using PowerPoint, his dodgy Photoshop, out of date cultural references and barrage of multimedia silliness have made him a trusty pair of hands on stages up and down the country. Come and enjoy a night of stand-up comedy. 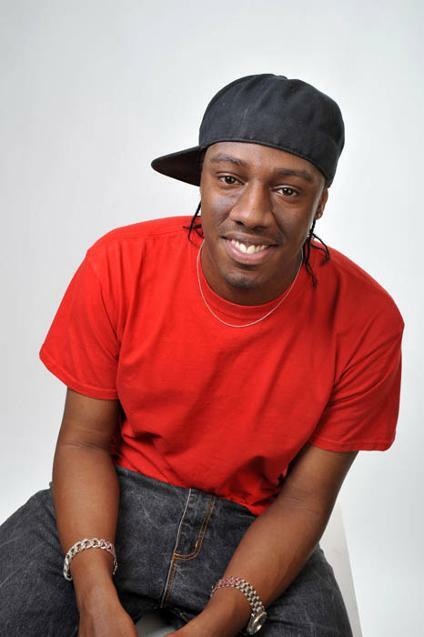 Our TV Headliner is the fantastic Nathan Caton! Opening the show is BBC New Comedy Award finalist Liam Pickford who’s unique style is a breath of fresh air to the circuit. Liam has crafted his own unique brand of stand up, mixing cleverly honed material and punchlines with excitingly unpredictable audience interaction. All this, mixed in with a hint of ‘whimsy’ and clever observations whilst delivered in a wonderfully unenthusiastic and grumpy style. 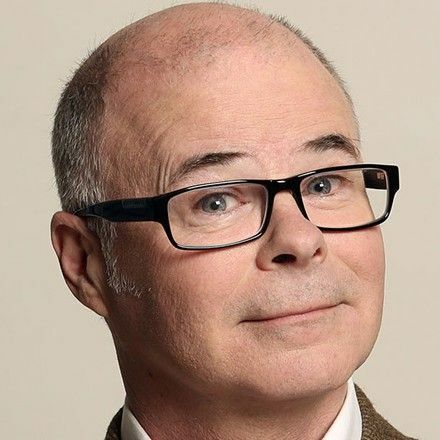 Also performing for your laughing pleasure on the night is Jim Campbell who has been busy with a chart-topping podcast, an acclaimed book and his personal life exploding. Everyone was right though; it’s good for material. The night is hosted by resident MC Adrienne Coles in our lovely intimate setting at Hotel Celebrity. Warm your winter cockles with a fantastic night of comedy! Come and LOL with us! Star of TV Plusnet Adverts. 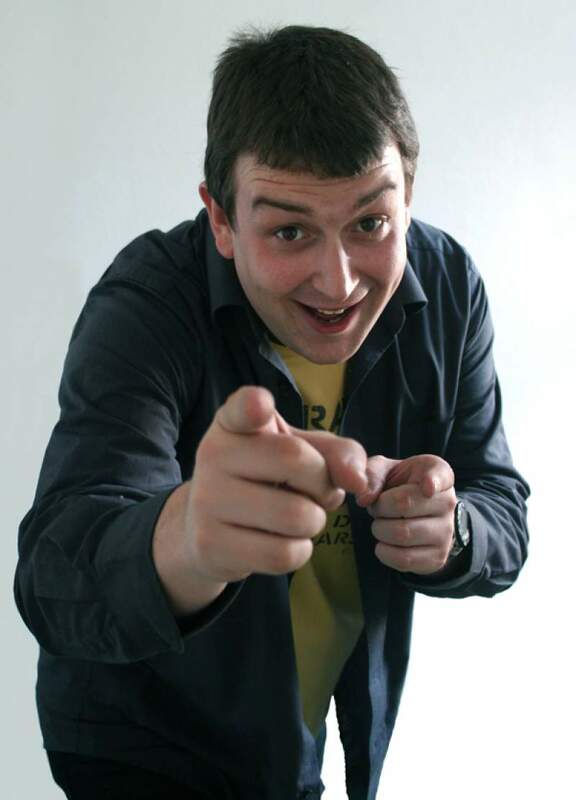 Hailing from Dewsbury, West Yorkshire charming northerner Craig is currently one of the hottest rising talents on the comedy circuit and you can see him right here at Hotel Celebrity! Opening the show is the hilarious George Rigden who is already one of the most exciting, hotly-tipped and sought after new acts on the UK comedy circuit and frequently gigs up and down the country for leading clubs having excelled in a host of new act competitions in his first year of performing. Rigden’s musical comedy is deliciously dark...he is very good at working the crowd and of all tonight’s acts he probably made the biggest impression." - Bruce Dessau, beyond the joke. 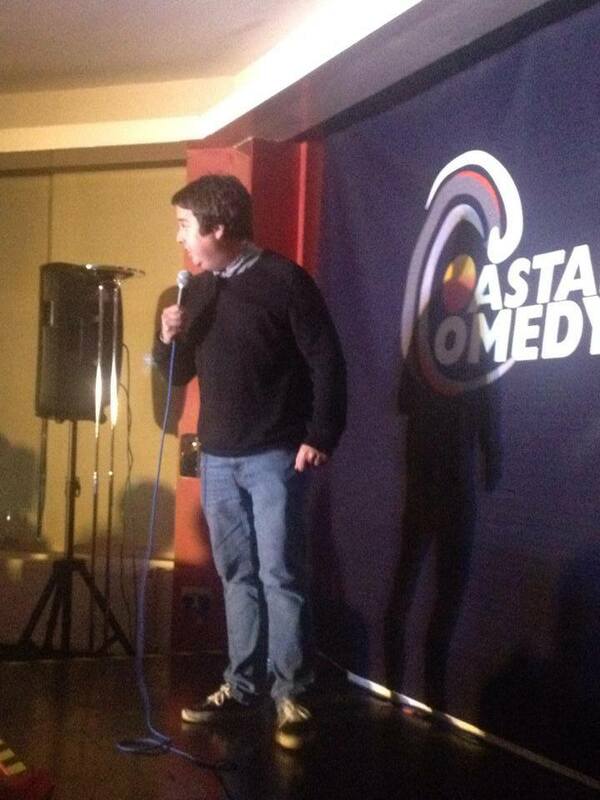 Also appearing on the night is Konstantin Kisin, a fast-rising Russian-British comedian. The night is hosted by Adrienne Coles you will be sure to receive the famous Coastal Comedy welcome. Come on your own, with your partner or in a group and improve your health with a belly laugh! This show is not to be missed. Advance booking is recommended. The Coastal Comedy New Year Special! Live at the Apollo (BBC2) and many more! Come and celebrate the festive season with us and enjoy a top night of live entertainment in Bournemouth’s favourite comedy club. 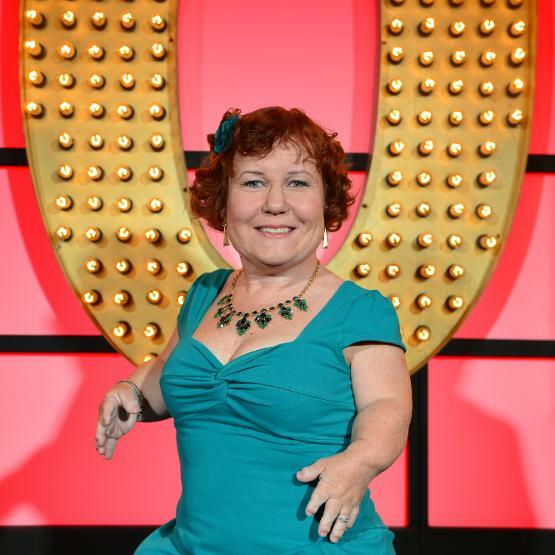 At 3’6″, Tanyalee is the Ferrari of comedy – low to the ground and kind of racy. Canadian born, Tanyalee inspires, enlightens, and entertains her audiences and is making the stage her home by touring all over the world and bringing the funny! Tanyalee is supported by Anthony Dewson who has shared the stage with some of the UK’s finest comedians including Harry Hill, Michael McIntyre, Frank Skinner, Micky Flanagan and Lee Mack. Ant passed his Grade 6 piano exam when he was 14 – and he hasn’t got any better since then! Classical music’s loss was comedy’s gain, and Ant now puts his limited skills to good use performing silly songs at comedy clubs up and down the country. Hosted by resident MC Adrienne Coles plus top support acts. Advance tickets are £15 from the Box Office on 01202 316316 or online (£20 on the door). VIP tickets are limited and £20 each, booked via the Box Office only. 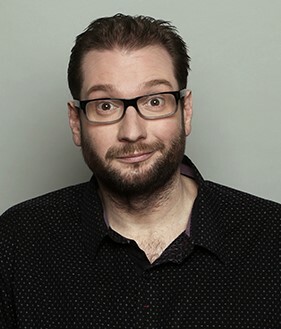 This Christmas Coastal Comedy push the boat out ……and present the sensational Gary Delaney! Gary’s the only comic ever to have got two gags in the same top 10 for Dave’s TV Funniest Jokes from the Edinburgh Fringe, and has become one of the most followed and quoted comedians in the country. He has also written extensively for TV and Radio including 8 Out Of 10 Cats and 8 Out Of 10 Cats Does Countdown, A League Of Their Own, 10’Clock Live, The British Comedy Awards and The News Quiz. That’s not all! Opening the show is the hilarious Dana Alexander as seen on Russell Howard’s Good News (BBC2) and one of Canada’s most outspoken and hilarious comics. Dana's comedic style is both refreshing and irreverent, drawing her material from her diverse lifestyle, her gay friends and her crazy Jamaican family. Adept, charming and astute, she is warmly funny with an impishly sarcastic sense of humour. 'Like a gift from the Comedy Gods' The Herald Plus top support acts. Advance tickets are £15 from the Box Office on 01202 316316 or online. We bring you the incredible Tony Law! 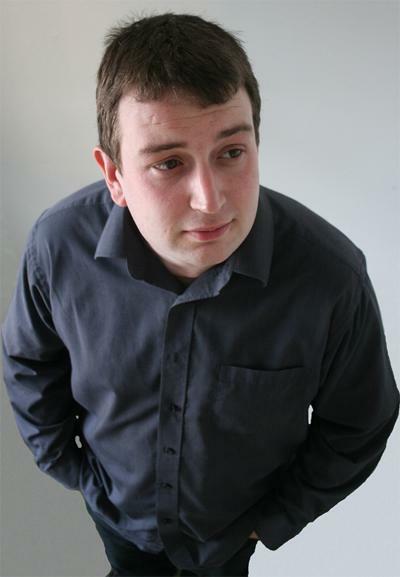 Tony is a triple Chortle award winner and was a Foster's Edinburgh Comedy Award 2012 nominee. 8 Out Of 10 Cats (Channel 4) and many more. 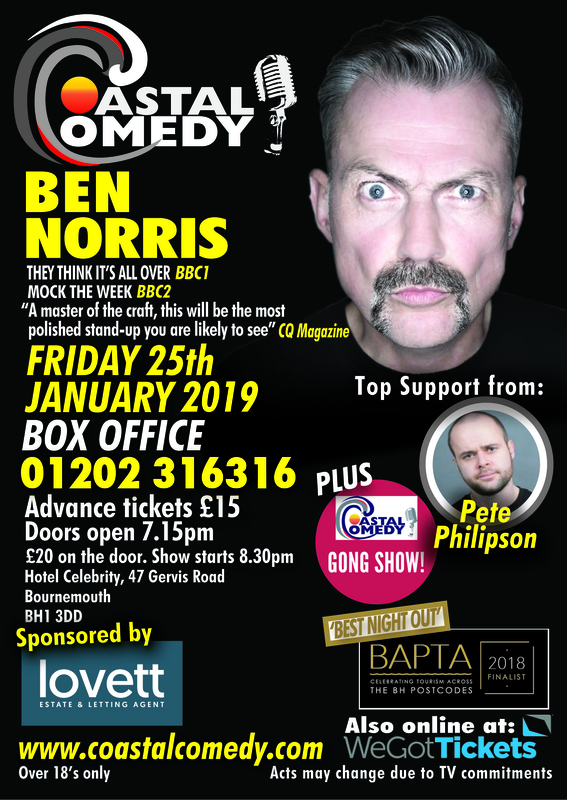 Enjoy a top night of live entertainment in our fabulously intimate venue, where you get to see a famous face close-up and personal at Bournemouth’s favourite comedy show. Come on your own, with friends or your other half and you are sure to receive a warm Coastal Comedy welcome. 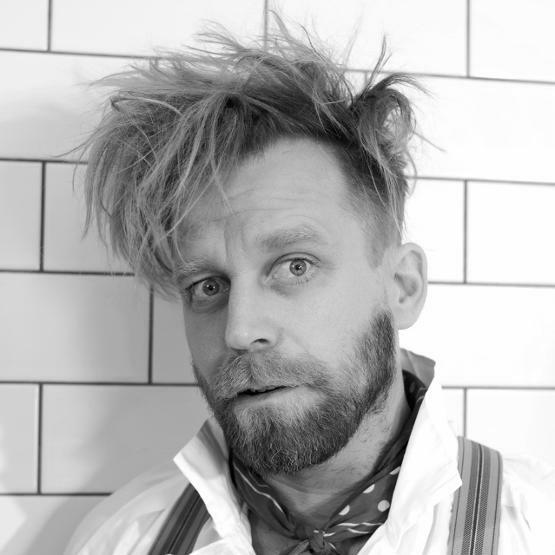 Tony Law is Canadian and known for his highly surreal material and delivery, and eclectic historical style of dress, favouring boots with turned-up jeans and a Viking/explorer style of hair. Many of his stand-up routines are ingeniously ad-lib and built around various subjects that he has thought of, but not planned a routine about. 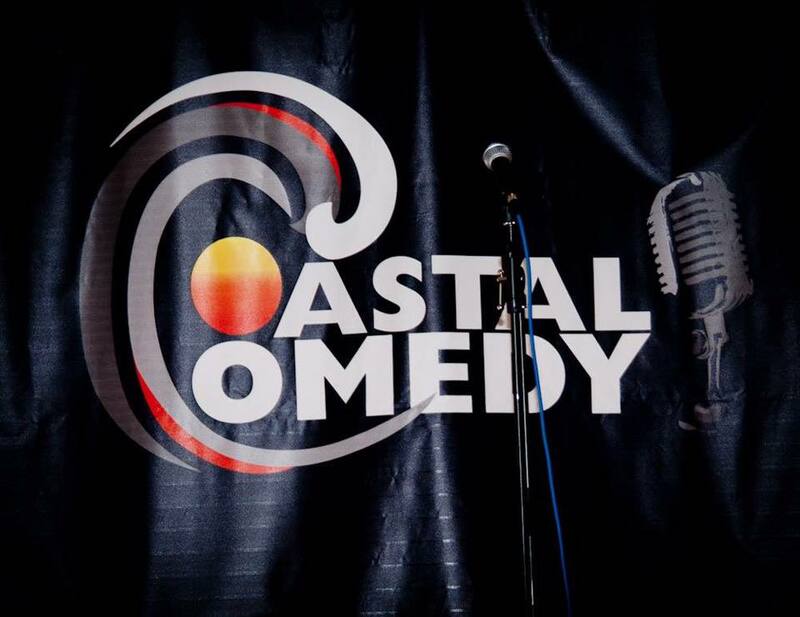 The Coastal Comedy Show on Friday the 27th of October with TV headliner Andy Askins! Enjoy a top night of stand-up comedy in Bournemouth’s favourite comedy club and finalist for the ‘Best Night Out’ 2017. 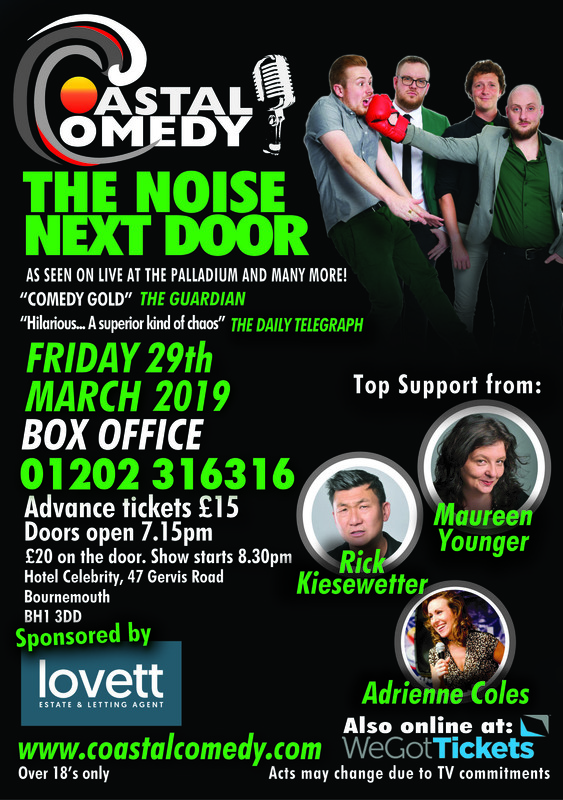 Coastal Comedy is Bournemouth’s best comedy club and you are guaranteed a fun night out at this sell out show. Come and enjoy a top night of entertainment that won’t break the bank and wake up smiling the next day. 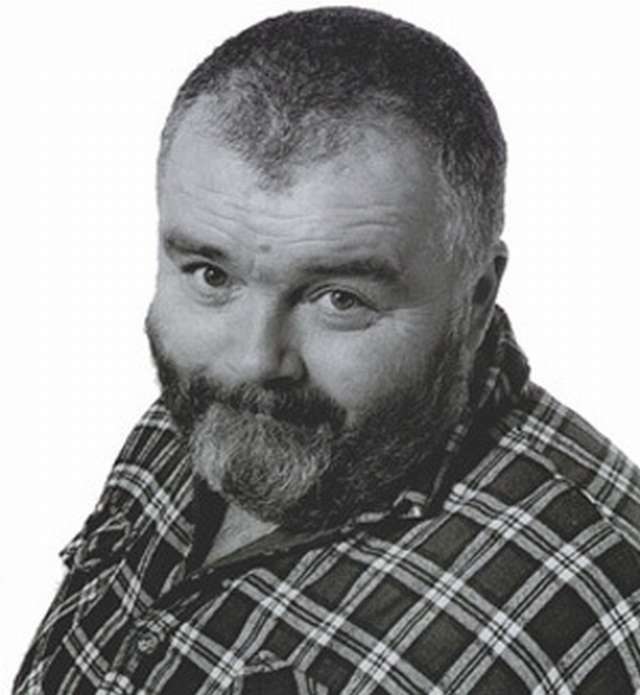 More about our acts: Kevin Mccarthy has been a comedian a long while, all his life infact, and has performed all over the world. 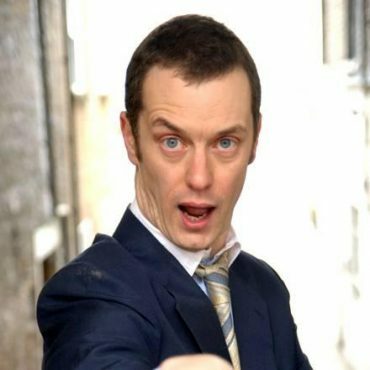 He not only performs on but also writes for television, having been involved recently in writing “The Sketch Show”, the BAFTA award winning ITV comedy, and has appeared on many television productions as a comedian, a comic actor, and indeed as a straight actor. His involvement with T.V. includes warm-up duties on such shows as “The Lottery”, and “Later, with Jools Holland”. He writes speeches for the management of such corporate giants as Coca Cola and provides corporate comedy work-shops for institutions, even teaching prisoners in Winchester prison from novice to performer in organised courses in jail. 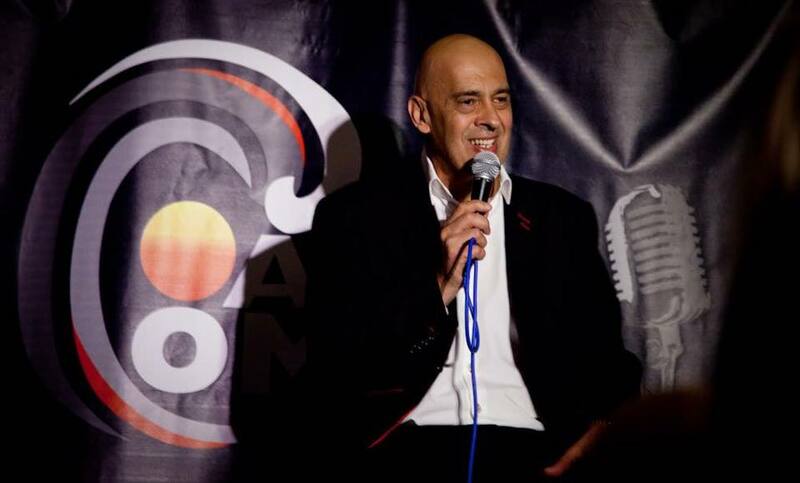 His reputation as a funny and importantly reliable act is acknowledged throughout the business both as a stand-up comedy set performer and perhaps more highly still as a compere/M.C. His experience and ability to connect to any audience is almost legendary. 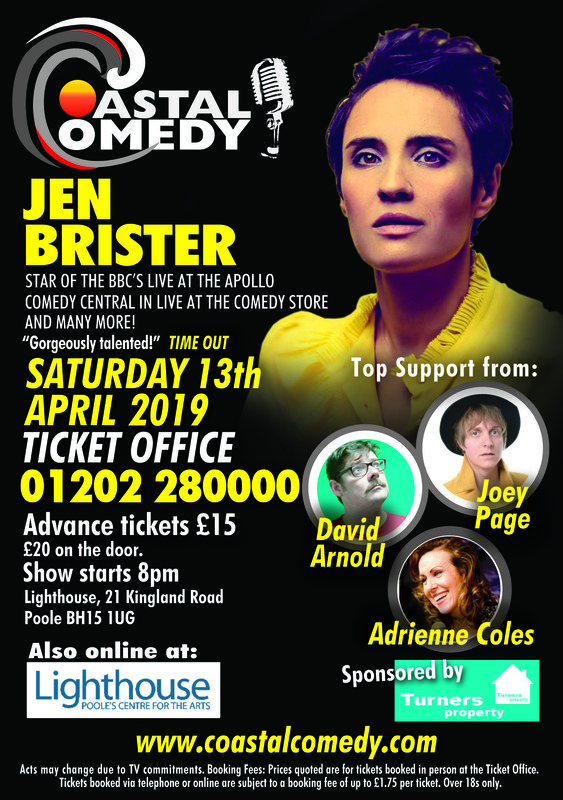 Plus top support acts, hosted by local comic Adrienne Coles and all in the wonderfully welcoming and intimate venue at Hotel Celebrity, Bournemouth. Advance tickets are just £12. 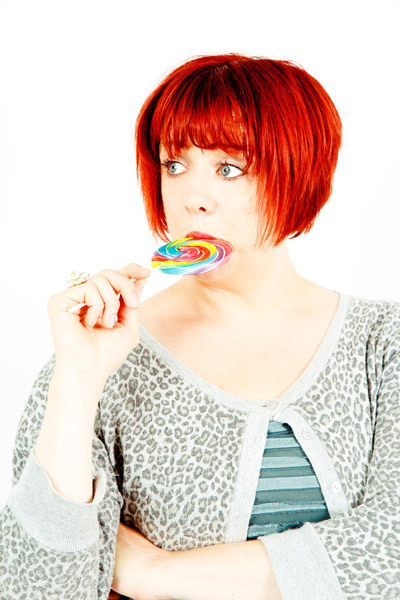 Coastal Comedy presents the stupendous Angela Barnes! Stand up for the Week (C4) and many more! Angela won the BBC Radio 2's New Comedy Award in 2011, and has continued to be a regular on the stand-up circuit, playing even bigger venues. She has also appeared on: Russell Howard's Good News, Russell Kane’s Whistlestop Tour for Radio 2, Stand up for the Week, written for Radio 4’s The News Quiz, played on Eddie Izzard’s Laughs in the Park on BBC Two, and developed her own series with BBC Radio Comedy. Travelling the length and breadth of Britain and playing a number of big name clubs throughout the UK Phil has worked along-side and supported some of Britain’s top comedians such as Jason Manford, John Bishop, Tim Vine, Lee Nelson, Patrick Monahan & Bobby Davro. Plus top support acts and hosted by local comic Adrienne Coles tickets are £12 for what is a top night out in the wonderfully intimate setting at Hotel Celebrity. Don't miss this top night out! A fantastic night of comedy! 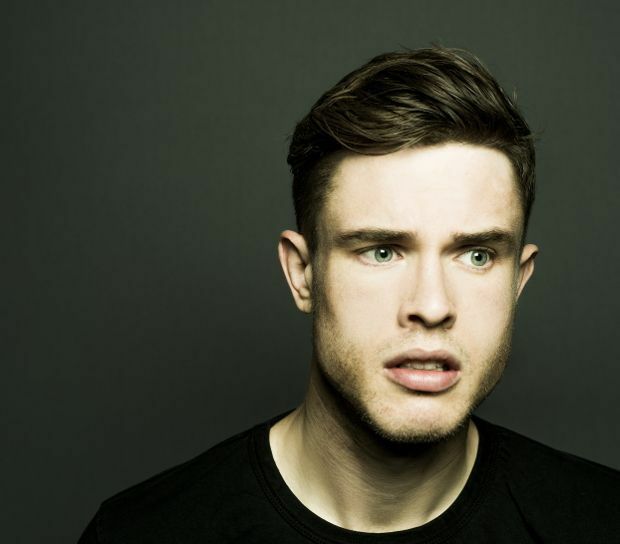 We are excited to bring you the incredible Ed Gamble live in our fabulous setting. As seen on Russell Howard’s Good News(BBC 2) Dave’s One Night Stand (Dave) Mock the Week (BBC2) and many more. ‘An ability to open his mouth and spontaneously say something hysterically funny’ (The Guardian). Ed Gamble is a stand-up comedian, writer and actor. He most recently starred in BBC America’s Almost Royal, a “cult US hit” (The Independent). Ed has appeared on some of the UK’s most popular TV Shows: Mock the Week (BBC Two), Man Down (Channel 4), Never Mind the Buzzcocks (BBC Two) and Russell Howard’s Good News (BBC Two), as well as presenting radio shows for BBC Radio One and BBC Radio Four. Opening the show is comedian Chris Purchase, fresh from a sell-out run of his new show ‘Distracted’ at Leicester Comedy Festival. Chris was nominated for What’s On magazine’s Best Comedian 2016, and is currently taking the comedy scene by storm with his mix of light hearted anecdotes and cultural satire, going viral multiple times has only increased his popularity. “Had the crowd roaring, lapped it up . Full of energy, loud, charismatic. Lovely.” – The Stand. Tom Glover is guest MC for this show with top support acts and in the wonderfully welcoming and intimate venue at Hotel Celebrity. Advance tickets are £12. 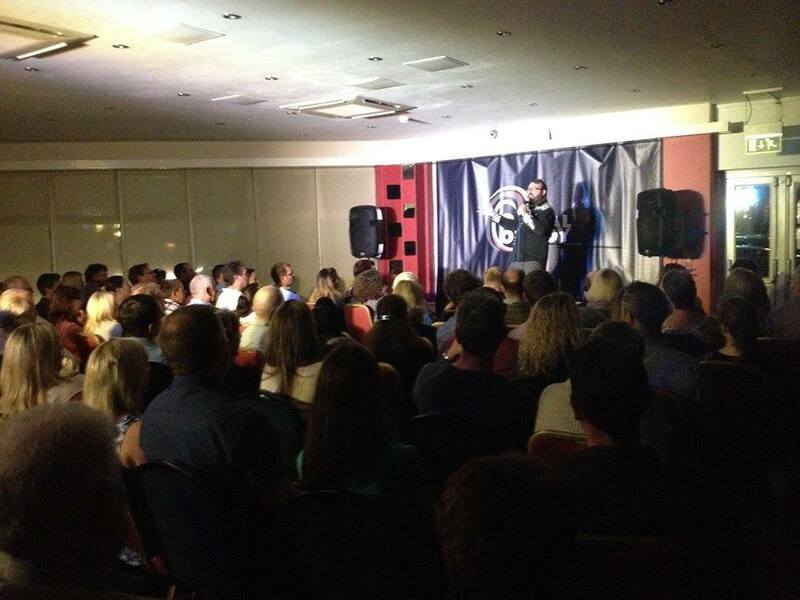 Coastal Comedy bring the amazingly funny Danny Posthill, right here in Bournemouth! As seen on Britain’s Got Talent (ITV) and many more. We are finalist for ‘Best Night Out’ in Bournemouth as part of the Bournemouth Tourism Awards 2017 and on Friday the 26th of May you can find out why! Here’s some blurb about our Danny: Danny Posthill has been making people laugh since the age of 16 after being talked into doing Impressions at his school talent show. Since discovering his passion for comedy Danny has never looked back. His Versatile act caters for all walks of life with unbeatable stand up and a string of impressions such as Jimmy Carr, Billy Connolly, Lee Evans plus many more to guarantee a night of laughter you will never forget Despite his young age he has performed all over the world, and is undoubtedly one of the most promising British comedians. Opening the show is local talent Gareth Richards. Gareth has appeared on Russell Howard’s Good News and Live at the Electric (BBC3) and co-hosted Frank Skinner’s Sony award-winning Absolute Radio show for two years and supported Frank on his 2014 tour. 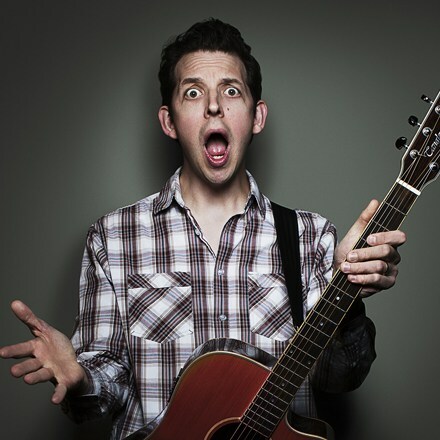 Gareth Richards’ hilarious stand-up, silly jokes and gorgeously low-key comedy songs have made him an instant favourite on the comedy circuit. Plus top support acts and in the wonderfully welcoming and intimate venue at Hotel Celebrity. Advance tickets are £12. To celebrate our 2nd birthday we bring you the incredibly funny Phil Butler! “Without doubt, one of the most exciting and original finds in comedy in recent years” - The Independent. Come and enjoy a top night of live entertainment at Hotel Celebrity, Bournemouth, Dorset. 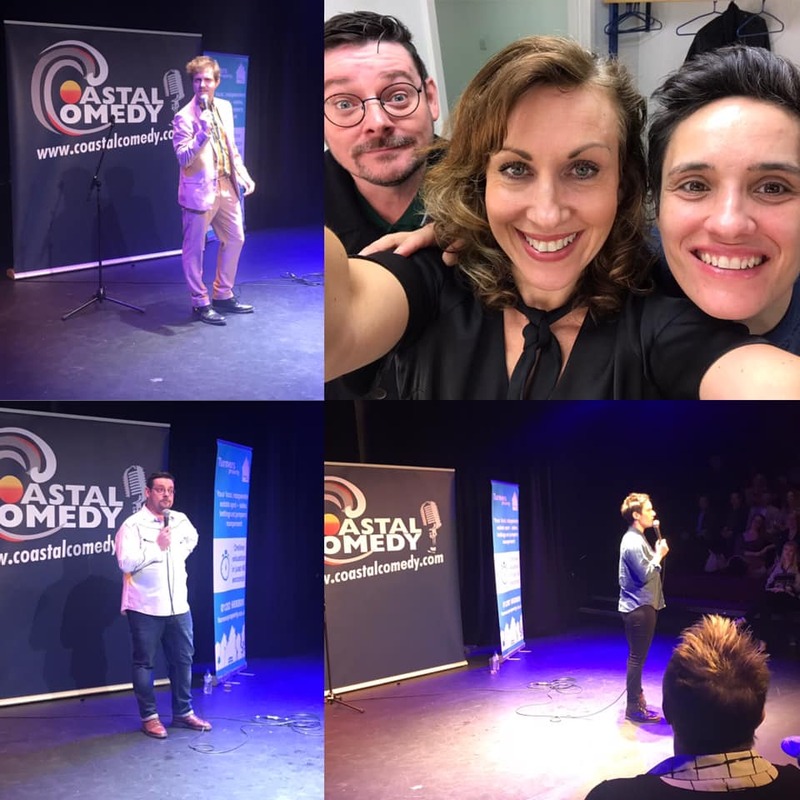 Coastal Comedy is one of just four finalists for Best Night Out as part of the prestigious Bournemouth Tourism Awards and you can find out why! There is a fun and welcoming atmosphere which is enjoyed by singles, couples and groups of mates and we offer great value for money too! Blurb about our headline acts: “Phil Butler’s audio/visual brand of comedy would have even non-english speakers rolling in the aisles. From cigarette-juggling, to a child's toy with Tourettes, his act has it all” - The Mirror. Phil Butler is truly a comedy act like no other. Using his razor-sharp wit to inject his hilarious take on entertainment. Showing off his skills including magic, juggling and ventriloquism, he creates a one-man variety show. In addition for the first time ever we will be having a GONG SHOW! Comics compete against the clock and the audience decide the winner who receives £50 prize and a paid spot at a future Coastal Comedy show! Also appearing on the 28th of April and opening the show is Abi Roberts. Abi and her big hair exploded onto the stand-up comedy scene in 2011, after a number of years as a session vocalist and cabaret performer. She has been dubbed by critics as "Brilliant, funny and charming”. 'Raucously and incredibly funny' - The Daily Telegraph. 'Must see comedian who is breaking new ground' -The Independent. Plus top support acts and in the wonderfully welcoming and intimate venue at Hotel Celebrity. Advance tickets are £12. 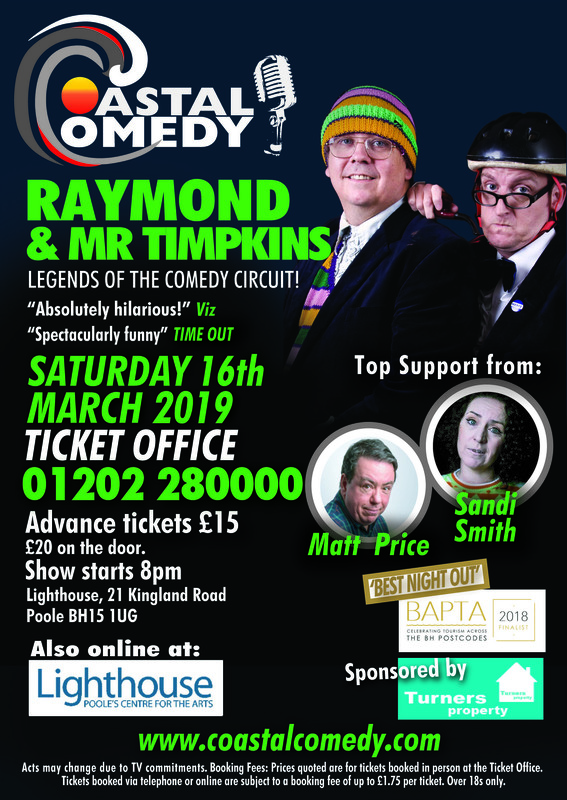 We bring you the hilarious Raymond and Mr Timpkins! Legends of the comedy circuit. 'It's freakish entertainment on a twisted stick', the charismatically challenged uncle and nephew duo, invite you into a world of stylophone rock anthems, brushed velvet arousal and 'indulgent, brilliant tackiness'. 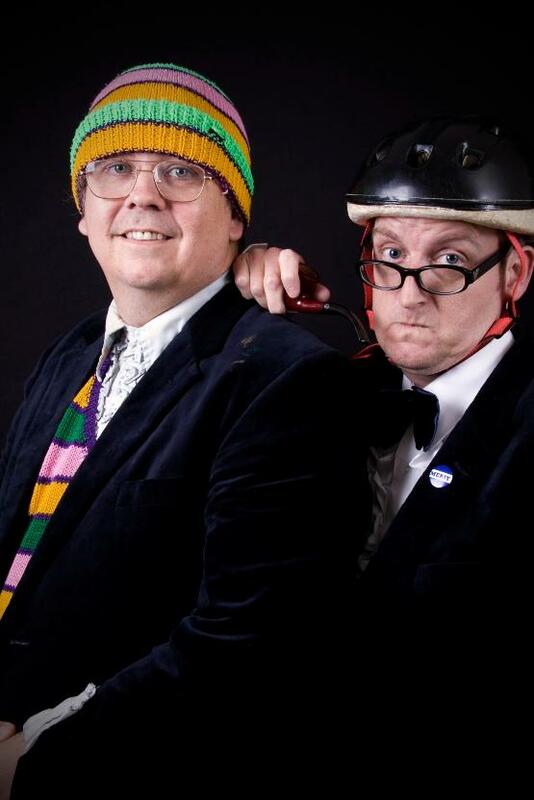 Likened to Morecambe and Wise and the Two Ronnies, anyone who can bring the house down with nothing more than a couple of Lidl carrier bags and an Oasis song have to be seen to be believed. 'A mad, anarchic triumph of stupidity over style. Not to be missed' (The Guardian). 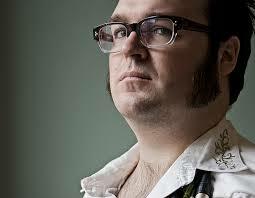 Support acts include Luke Honnoraty from North Devon. Luke is a confident, engaging performer who's skilled story telling is sure to captivate any crowd and he handles dark topics with a charismatic delicacy, performed with a cheeky, personable delivery. Ellie is a stand-up comic, actor, writer and presenter based in London. 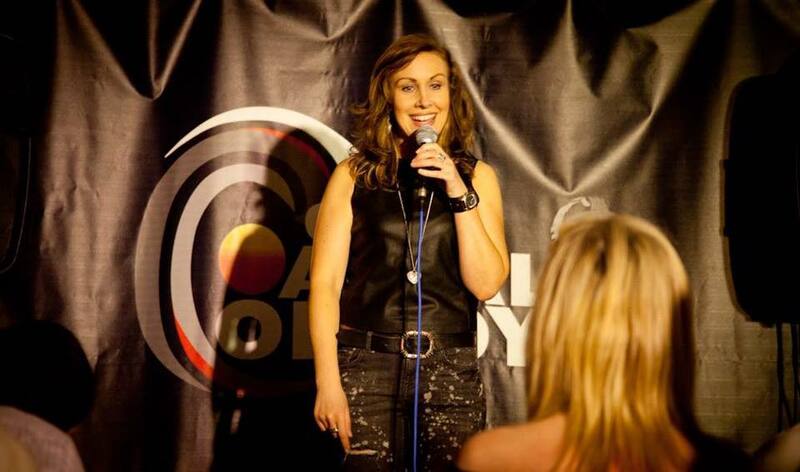 Essex-born ex-model Ellie Taylor decided to give stand-up a go in 2011 after seeing a friend perform a five-minute set – and was soon snapped up to be a contestant on ITV1's talent/reality series Show Me The Funny and now graces our TV screens on numerous shows. See the incredible Jonny Awsum right here in Bournemouth's top comedy club!! Beat the winter blues and enjoy a night of top live entertainment and get to see the sensational Jonny Awsum! Jonny Awsum exploded onto the professional comedy scene with a crowd-pleasing set that's seen him perform his special brand of musical comedy around the world. He's a comedic whirlwind, and has risen quickly from a fresh-faced newbie to a highly sought after headline act. Audience members don't just leave entertained, they leave as fans! Jonny has been traversing the UK, and indeed the World, armed with an impressive arsenal of jokes and his trusty guitar. 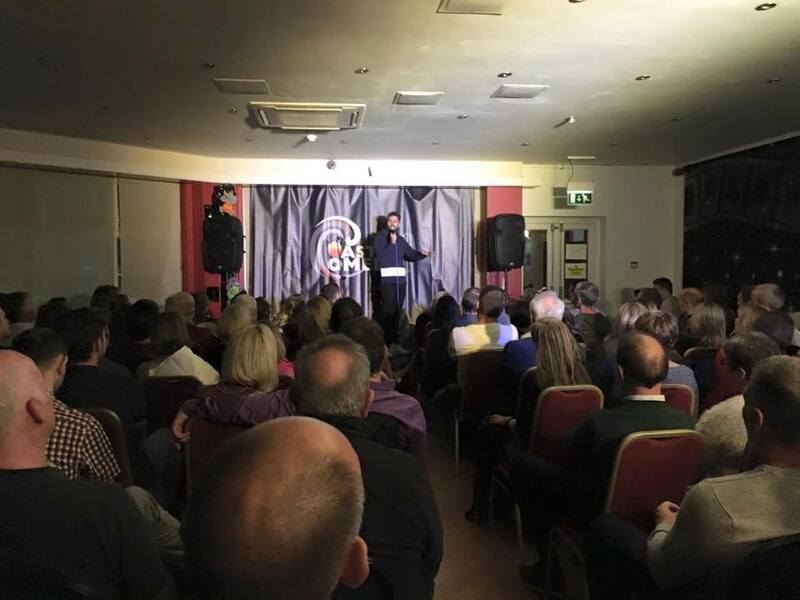 He's a must see at comedy clubs, as his crowd-pleasing set sees Jonny regularly ending his sets to standing ovations and demands of an encore. Equally at home in front of a camera, Jonny has recently appeared on the nation's TV screens, presenting for Sky Sports, is a familiar face from the current Experian adverts, and features in the Cravendale 'Cats with Thumbs' campaign, which has been viewed over a million times on YouTube. 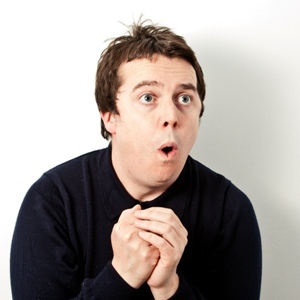 See TV Headliner Paul McCaffrey as seen on Impractical jokers (BBC3) and many more. New Year’s Eve has never been known for being a cheap night out, so how about celebrating with us the night before with 3 big comedy names for £12? On Friday the 30th December at Coastal Comedy, we have Paul McCaffrey, James Alderson and Matt Price providing the laughs at our lively and intimate Bournemouth venue. 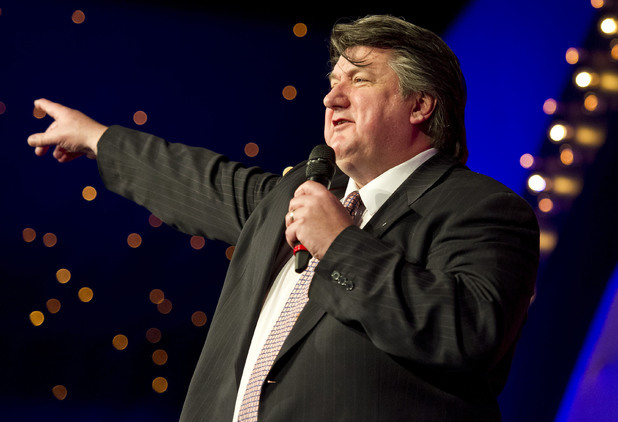 Headlining the festive edition this year is the award-winning Paul McCaffrey. Winner of both the London Paper and Latitude Festival New Act competitions, his comedy career has gone from strength to strength ever since. With shows full of anecdotes we can all relate to, this natural story teller will have you giggling well into the New Year. Paul frequently plays at some of the biggest clubs in the UK and has the talent to charm any audience with his impeccable delivery. 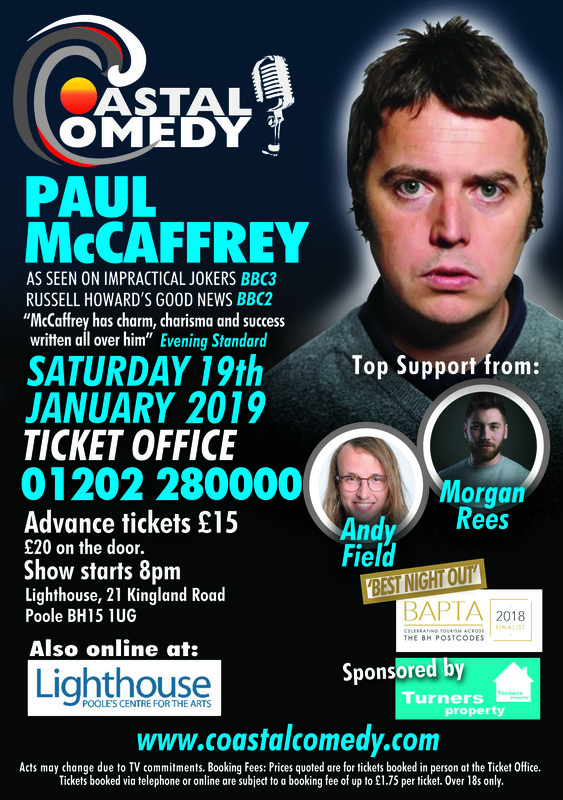 As well as having over four solo shows at the Edinburgh Fringe under his belt, Paul has made a number of TV appearances including Russell Howard’s Good News (BBC3). You may have also heard him on the radio, as he is a regular guest on The Warm Up with Matt Forde and has featured on Russell Kane’s Whistle-Stop Tour (BBC Radio 2). “McCaffrey has charm, charisma and success written all over him” – Evening Standard “Likeable, animated and fluid with a first rate sense of timing” – Chortle "A total natural, his storytelling is utterly unique, never anything less than gut-bustingly hilarious" – GQ Magazine. 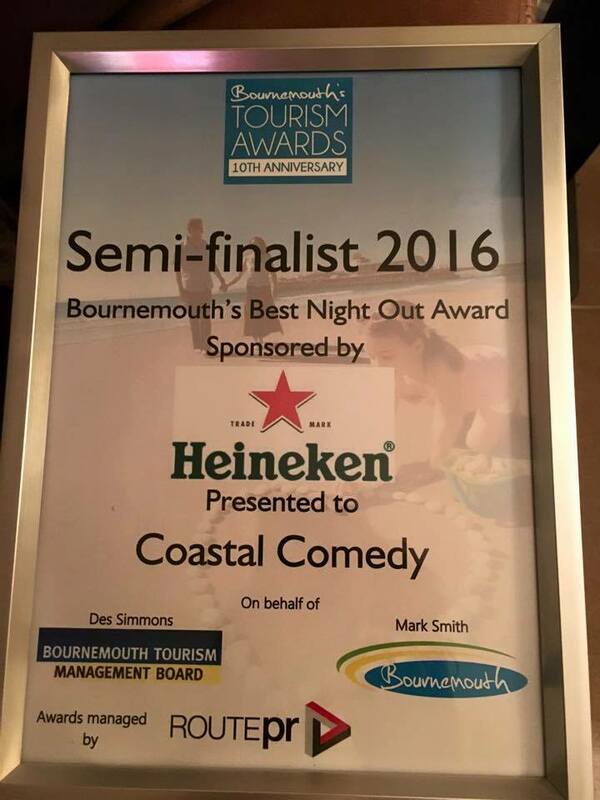 Coastal Comedy has been nominated again for ‘Best Night Out’ as part of the Bournemouth Tourism Awards and you can find out why! Come to our fabulous intimate setting and see a top show of live entertainment. Here’s some blurb about our November acts: Adam Bloom was 18 months old when his parents nicknamed him The Voice, and when he was 10, he told them he was going to be a comedian. By the age of 23, he was. 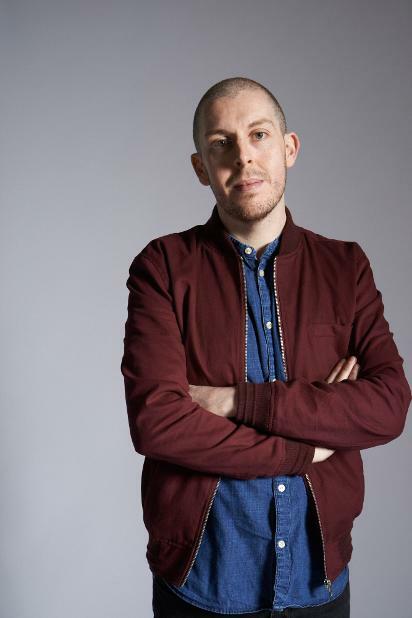 Adam has appeared on various stand-up and panel shows on TV, and has recorded three series of his own Radio 4 show, The Problem with Adam Bloom. Ricky Gervais says: Adam Bloom has been one of his favourite comedians for ten years: ‘…Bloom not only has meticulous, brilliant lines, but also an intense and fragile honesty.’ The Independent describes him as being ‘…in the premier league of comedy,’ and The List says: ‘Bloom is perhaps the perfect comedian.’ He’s also a Time Out Award winner for best stand-up and has been hired to write for numerous TV and radio shows. Loveable welsh man David Arnold is opening the show. An act who never fails to deliver a well-rounded and polished performance that has his audience laughing throughout and is quickly establishing himself as one of the most exciting new acts on the comedy circuit, with his enthusiastic, engaging and endearing style. Despite only doing his first gig in late 2012 he is fast developing a reputation as one of the South Wests’ brightest talents and one not to be missed. Plus support acts and all in the fabulous intimate setting at Hotel Celebrity. Tickets are £12 in advance from the Box Office on 01202 316316. Carl has also appeared on various TV shows including Mock The Week, Dave’s One Night Stand, Stand Up for the Week, Russell Howard’s Good News, Follow The Football, Comedy Store and, most recently, Alan Davies: As Yet Untitled. 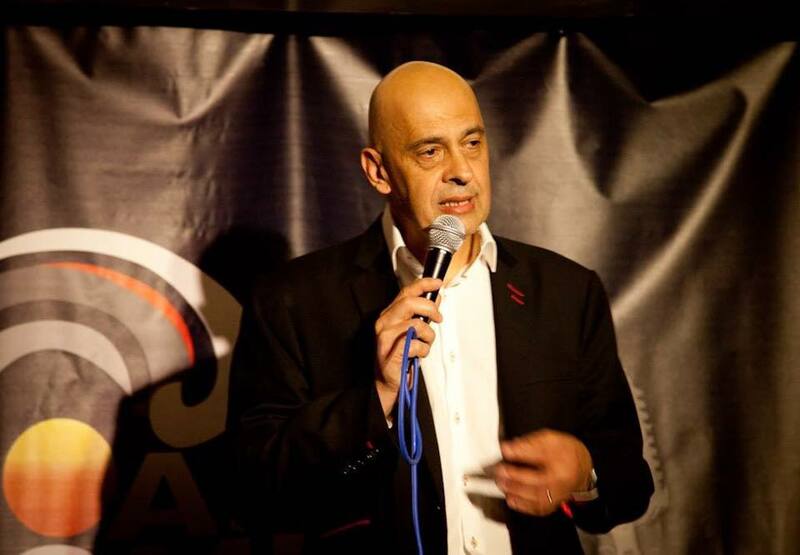 He is also a regular on radio appearing as a guest on such shows as BBC 5live’s The Back End of Next Week, Radio 4’s Loose Ends and Act Your Age as well as being a regular guest on talkSPORT. “Excellent, fast-rising comic with pacy anecdotal routines” Sunday Times. On the 28th of Oct we also have great support acts and all in the great comedy intimate setting at Hotel Celebrity, Bournemouth for just £12! 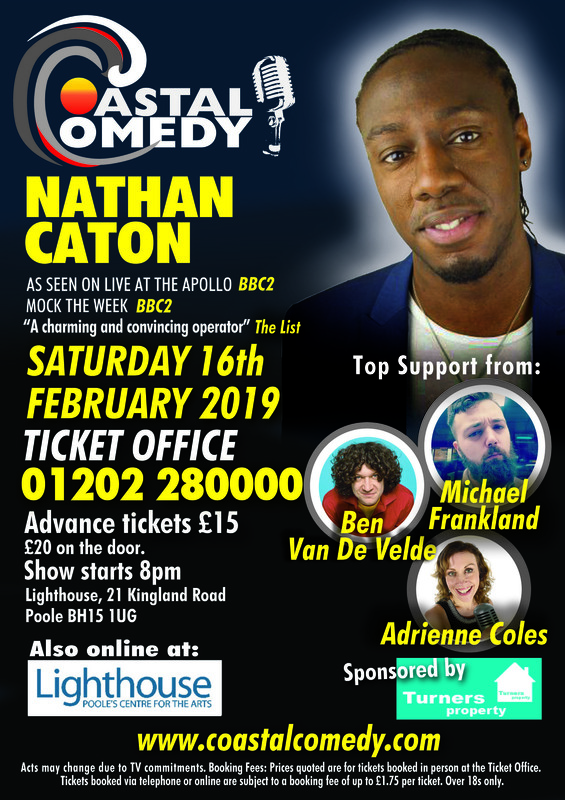 Bournemouth's best comedy club storms into the new season with the fantastic TV headliner Dane Baptiste as seen on ‘Live at the Apollo’ (BBC1) and many more. See him now in the fabulous intimate setting at Coastal Comedy, whilst you can. 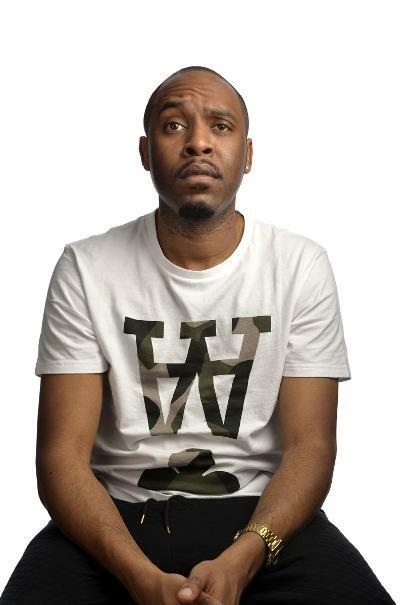 “Dane Baptiste is a comical genius” Edinburgh Festival Magazine “Dane Baptiste is equipped with the quiet confidence you only get from knowing that you’ve got gags to reduce any audience to hysterics” The Guardian. In 2014 Dane became the first Black Briton to be nominated for the Foster’s Best Newcomer Award, being shortlisted for his debut show Citizen Dane. 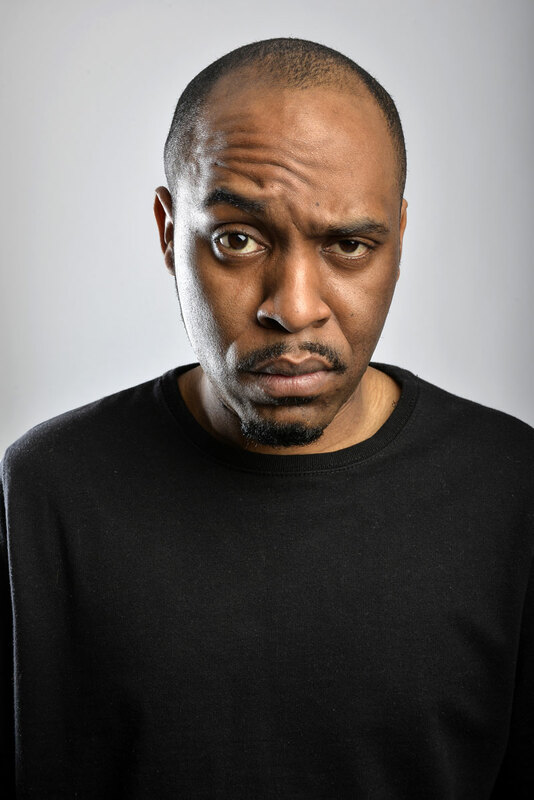 Original, provocative and excepAs seen on: ‘Live at the Apollo’ (BBC1) 'Mock the Week' (BBC2) 'At the Comedy Store' (Comedy Central) We storm into the new season with the fantastic TV headliner Dane Baptiste see him now in the fabulous intimate setting at Coastal Comedy, whilst you can. “Observational comedy at its finest” The Independent “Dane Baptiste is a comical genius” Edinburgh Festival Magazine “Dane Baptiste is equipped with the quiet confidence you only get from knowing that you’ve got gags to reduce any audience to hysterics” The Guardian Dane Baptiste is Stand Up Comedian and Writer from South East London. 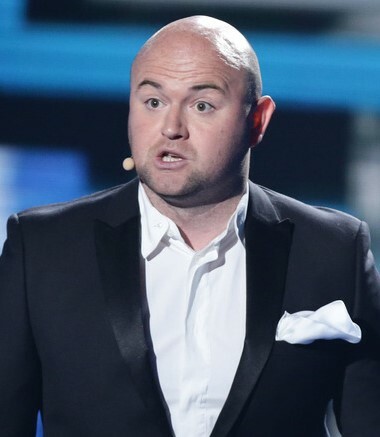 Since bursting onto the comedy circuit, he has risen up the ranks quickly achieving notable success in numerous comedy competitions and is now a regular at the country's most famous venues. Original, provocative and exceptionally prolific - Baptiste is already being hailed as one of the most exciting acts to break in years. 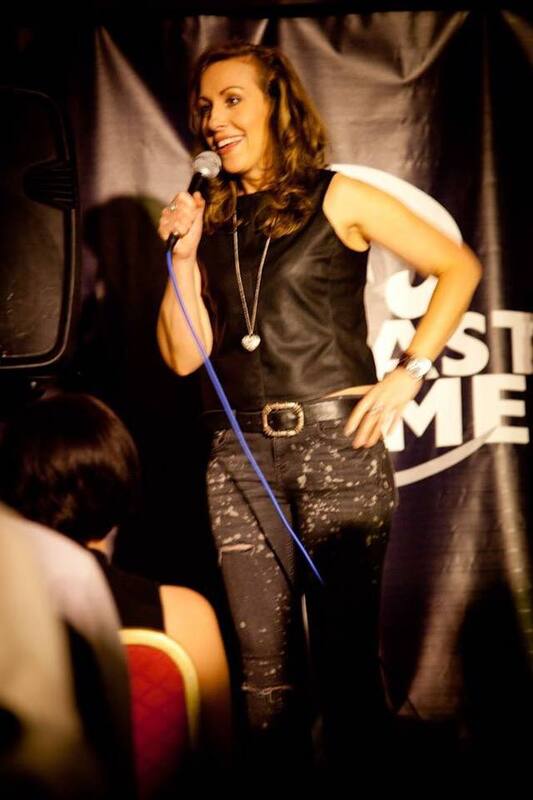 Also supporting on the night is the fabulous Meryl O’Rourke who has delighted comedy audiences, hosted pop concerts and performed at the Hammersmith Apollo, supporting Frankie Boyle as part of his national tour. Meryl appears regularly on Big Brother's Bit On The Side, Channel 5. A talented and sought after gag writer, she has worked on numerous flagship panel shows and comedy shows for the BBC, ITV, Channel 4 and Dave. 5 * * * * * As near perfect as you can find. Charming delivery keep the audience in no doubt they've just seen one of this year's fringe highlights" British Comedy Guide "Ripe with comedy. A unique perspective: sharp and dark, and refreshingly unsentimental" Stephanie Merritt, Observer exceptionally prolific. All in the wonderful setting at Hotel Celebrity, Bournemouth. Hailing from Dewsbury, West Yorkshire charming northerner Craig is currently one of the hottest rising talents on the comedy circuit. 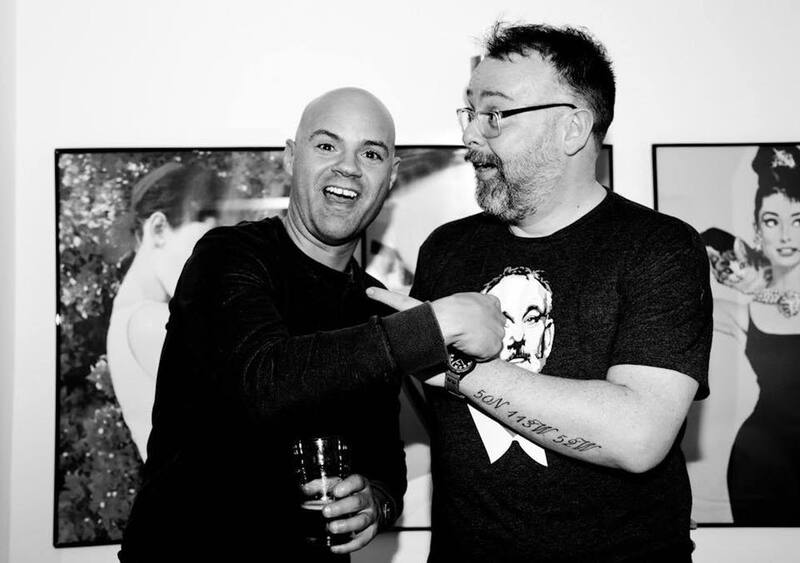 Craig has shared the stage with some of the very best comedy acts in the business including Harry Hill, Stewart Lee and even Hollywood legend Robin Williams. He rapidly became a master of the compere's art; able to turn any crowd from a lacklustre mob into a clapping, cheering, delirious audience ready to laugh all night. Having honed his talents as an MC introducing others, in 2008 he began bringing his impressive stage presence and flair for audience banter to his very own stand-up set. Since then, his rise through the comedy ranks has been nothing short of meteoric. Within just 1 month he had reached the final of The Other Side New Act of the Year competition and within 3, the final of the coveted Hackney Empire New Act of the Year. In the last two years he has also appeared in a comedy film alongside Adam Hills and Brendon Burns and recorded a comedy pilot for the BBC. An instant crowd pleaser with a charismatic, mock-confrontational style, Craig is now a highly sought-after act performing all over the UK. Supporting Craig is Tom Lucy and at 19 years old, Tom Lucy is one of the youngest professional comedians in the UK and one of the most exciting new talents on the circuit Having won the prestigious Leicester Mercury Comedian Of The Year 2016 and The Comedy Store King Gong 2014 you’ll need to catch this young talent while you can. “Watch him live and you’ll quickly understand the excitement” The Guardian Also performing on the night is Ben Van Der Velde and local comic, Adrienne Coles hosts the night all in a lovely venue. A fantastic night of comedy! 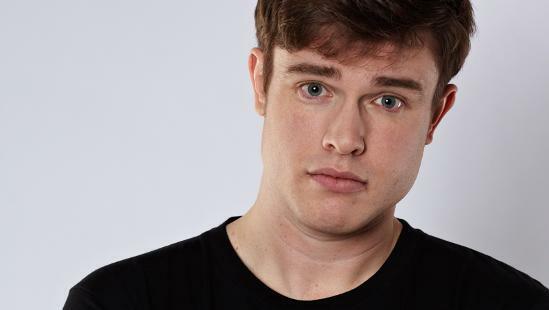 See Ed Gamble live as seen on in our fabulous setting: Russell Howard’s Good News (BBC 2) Dave’s One Night Stand (Dave) Mock the Week (BBC2) ‘An ability to open his mouth and spontaneously say something hysterically funny’ (The Guardian). Ed Gamble is a stand-up comedian, writer and actor. He most recently starred in BBC America’s Almost Royal, a “cult US hit” (The Independent), which is soon returning to the screens for a second season. Ed has appeared on some of the UK’s most popular TV Shows: Mock the Week (BBC Two), Man Down (Channel 4), Never Mind the Buzzcocks (BBC Two) and Russell Howard’s Good News (BBC Two), as well as presenting radio shows for BBC Radio One and BBC Radio Four. He won the prestigious Chortle award for Best Compere in 2014. Bob Mills burst on to the London Comedy scene in 1985, turning the faltering "Alternative" establishment on it's head with his unique, challenging brand of laddish irreverent stand-up. Over the next ten years he established himself as one of the most successful live acts in the country, as well as putting together a string of acclaimed TV and radio credits. His performances as host of ITV's flagship daytime game show 'Win Lose Or Draw', treading the fine line between pensioners favourite, and students cult hero, and he is well known for the weird and wonderful late night 'In Bed With MeDinner'. 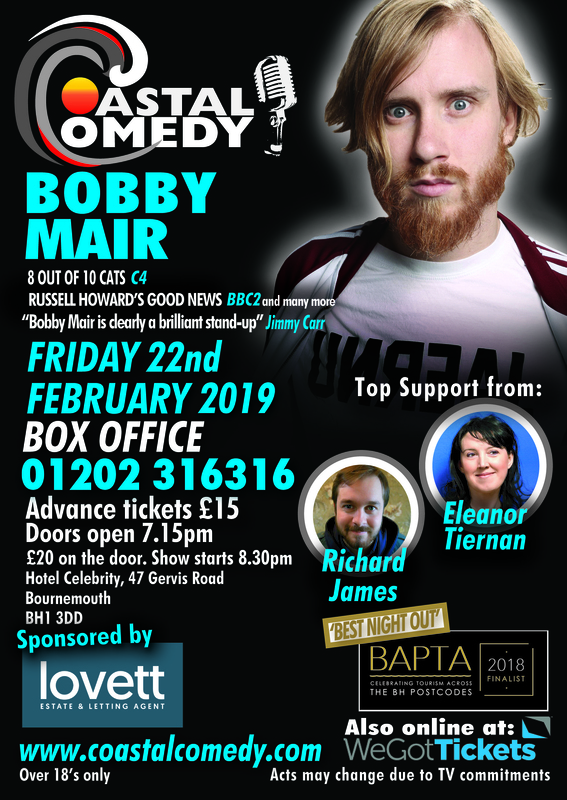 Bob is supported by Anthony Dewson and Bryan Lacey – hosted by local comic Adrienne Coles, in the wonderful setting of Hotel Celebrity and our top comedy show. This is going to be a great night out in Bournemouth. Television appearances include: Michael McIntyre’s Comedy Roadshow (BBC1), Celebrity Deal or no Deal (CH 4), Harry Hill’s TV Burp (ITV), Al Murray’s sit-com ‘Time Gentlemen Please’ (Sky), Soccer AM (Sky 1), The Comedy Store (Comedy Central). Mike Gunn’s history is as interesting and entertaining as his comedy. A misspent youth and a series of grim jobs cultivated his cynical outlook on life and a perverse desire led him to the world of stand-up. A self-confessed pessimist, he describes himself as “not a natural choice for a career in laughter”. Early in his career Mike was supporting the likes of Jo Brand and Alan Davies and recently supported Lee Mack on his huge UK tour. He now headlines at all the top comedy venues in the UK and is rapidly reaching cult status on the circuit. With his easy charm, cheesy singing voice, razor-sharp wit and clownish physicality Rob has quickly established himself as a firm favourite on the comedy circuit around Britain. Our TV Headliner is the fantastic Felicity Ward! Josh (BBC1), and heard on The Museum of Curiosity (BBC radio 4). Opening the show is James Alderson. James is an award-winning, record-breaking international comedian! He has an exuberant and effervescent style and draws on his life experiences to feed his routines. Women laugh at his hilarious observations and self-depreciating style, and men laugh with him. As well as supporting Jo Brand and Eddie Izzard, James was also nominated in 2015 for the fourth year running as "Best Comedian" by The Guide! As seen on: Russell Howard's Good News (BBC2)Phil Kay Feels (Channel 4) QI (BBC2) and many more. 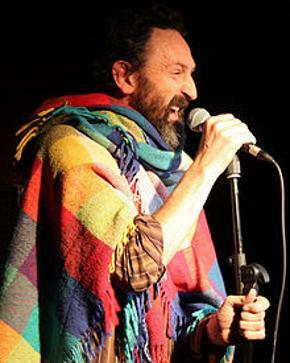 Phil Kay burst on to the comedy circuit in 1989, when he won the new act contest So You Think You're Funny in only its second year, and quickly garnering a host of awards, nominations and glowing reviews. Since then, the plaudits have never stopped as he conquered first the live stage and then television, with appearances on such shows as Russell Howard’s Good News (BBC2) Phil Kay Feels, (Ch 4), Next Stop Phil Kay (Ch 4), Edinburgh Nights (BBC1), Montreal Festival of Fun (Ch 5) and plenty more besides. Phil's comedy is a unique blend of energy, improvisation and leaps of imagination that take his audience on a joyride they'll never forget. Even Phil has no idea what might happen when he unleashes his crazy brand of improvised comedy mayhem. He possesses the rare gift of creating a space where audiences feel like they are kids again, all taking part in a practical joke. Phil's first love, however, remains live stage work ­ and only by watching his live performances will audiences really see him at his very best. Phil Kay is stand-up comedy's answer to spontaneous human combustion ­ a rare, explosive and always surprising phenomenon that simply cannot be contained. Phil tours Britain constantly and is a firm favourite at the Edinburgh Festival Fringe, where he performs yearly to sell-out crowds and critical acclaim. Joel is one of the most exciting new talents on the UK comedy circuit, and in demand performing at the top comedy clubs in the country. 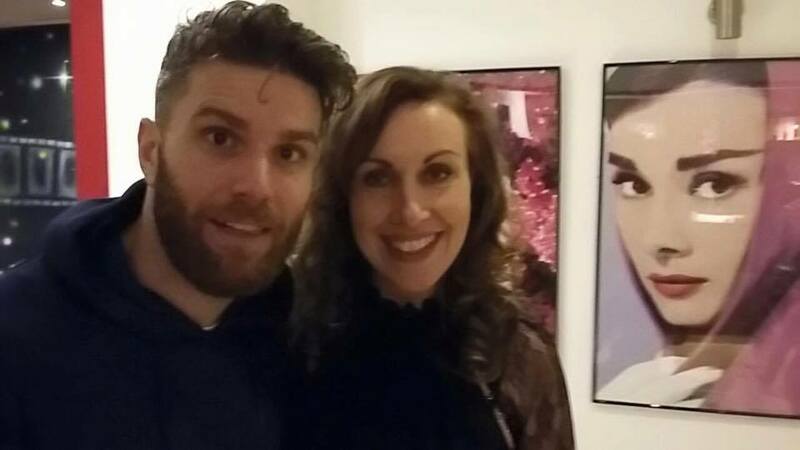 International globetrotter, English Comedian of the Year finalist, SKINS contributor and general heart throb, Joel Dommett is known for reducing sell out audiences into bouts of uncontrollable laughter. 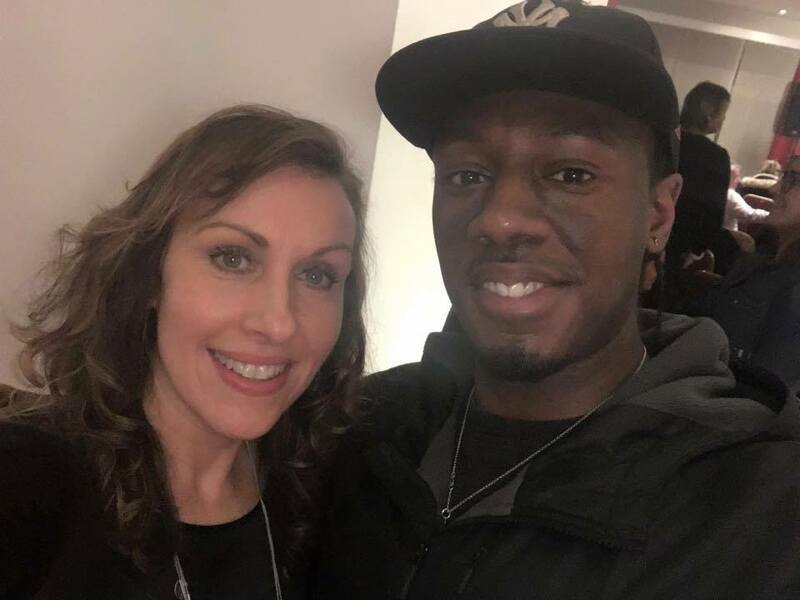 Joel is a regular on UK television having started out as being the face of MTV in 2012 he is now team captain on the ITV2 comedy show Reality Bites. Fans of Made in Chelsea will recognise him from Live in Chelsea (E4) which he presents. He has also starred in How to Survive a Disaster Movie (Channel 5), Russell Howard's Good News (BBC3) and the hugely successful Impractical Jokers (BBC3). Zoe Lyons as seen on Mock the Week, The Wright Stuff, Michael McIntyre’s Roadshow and many more. 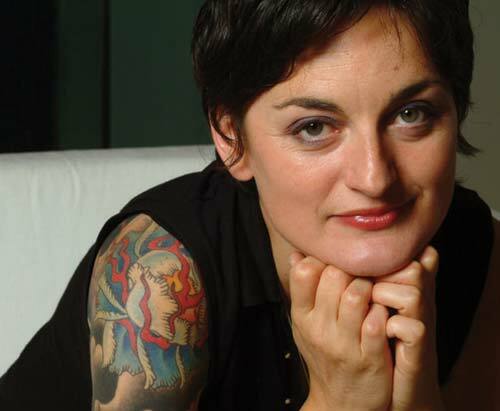 Funny woman Zoe Lyons first grabbed the critics’ attention back in 2004 when she won the Funny Women Awards. In 2007 she bagged a Best Newcomer nomination at the Edinburgh Fringe, with her debut show, ‘Fight or Flight’, and Dave’s Funniest Joke of the Fringe in 2008. She’s since toured all over the UK and internationally, and her television appearances include Mock The Week, The Wright Stuff, Dave’s One Night Stand and Michael McIntyre’s Comedy Roadshow. Her 2014 Edinburgh Fringe show, Mustard Cutter, received a host of four and five star reviews. Angela won the BBC Radio 2's New Comedy Award in 2011, and has continued to be a regular on the stand-up circuit, playing even bigger venues. She has also appeared on: Russell Howard's Good News, Russell Kane’s Whistlestop Tour for Radio 2, Stand up for the Week, written for Radio 4’s The News Quiz, played on Eddie Izzard’s Laughs in the Park on BBC Two, appeared on Russell Howard's Good News on BBC Three, developed her own series with BBC Radio Comedy.